Eide’s Safety Brakes at BAUMA 2019 Eide’s safety brakes will be exhibited from April 8 to 14 at BAUMA, the world’s most important trade fair for the construction industry, which is held in Germany every three years. Presentation of a new product The primary objective is the presentation of a new and exclusive technology product launched at the beginning of 2019: the DBQ centrifugal brake, the primary function of which is to limit the speed of, for example, a forklift or a motorised scaffold. Moreover, thanks to the centrifugal force used for its operation, it does not require any external power supply. This brake, which can already be found on some of Eide’s customer machines that will be exhibited at BAUMA, could be seen in action by many other potential customers who, in turn, will know all its advantages. 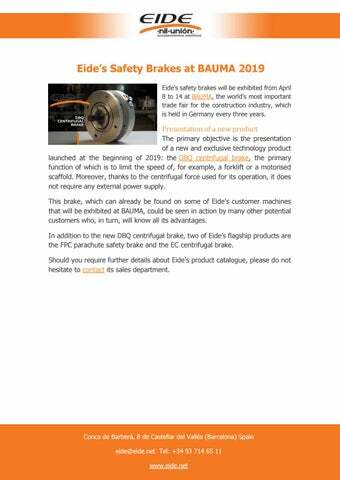 In addition to the new DBQ centrifugal brake, two of Eide’s flagship products are the FPC parachute safety brake and the EC centrifugal brake. 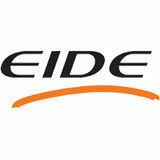 Should you require further details about Eide’s product catalogue, please do not hesitate to contact its sales department.